During last week's Monaco Yacht Show I noticed Lurssen's 61m superyacht Phoenix among the impressive range of yachts displayed by Burgess and, talking to the company's CEO Jonathan Beckett, learn that she's a joint central agency for sale with Moran Yacht & Ship. Built by the German yard in 2004 to Lloyds class, this opulent tri-deck yacht has an Andrew Winch interior accommodating 12 guests in six staterooms including a full beam master suite. 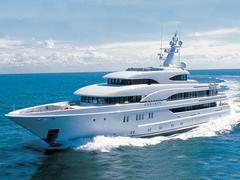 Phoenix carries 16 crew, has a cruising speed of 14 knots and is asking €65 million.